We always get excited when our new stock arrives. 2016 is still 10 months away but we need to be planning well ahead if we are going to be ready for the 2015 season. The Lesvos 2016 calendar features 12 pictures that we have not published before, although some of the locations are old favourites. 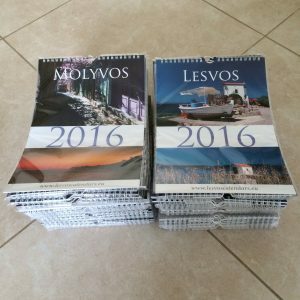 The Molyvos 2016 calendar features 5 new pictures together with customer favourites. It includes the lightening strike that I captured during a spectacular storm last August. It also includes the Agora which was voted “The World’s Most Magical Street Shaded By Flowers And Trees.” If you have not been to Molyvos in the spring then you can only imagine the dazzling purple and heady scent of the wisteria. Sadly we do not have a “scratch & sniff” version of the calendar.